[Trump] is a true, great master of the great game of this age, the Celebrity Game. Attention is what he lives on. Celebrity without substance. His “reality” is “virtual”—i.e. non-existent—but he used this almost-reality to disguise a successful bid for real power. Every witty parody, hateful gibe, clever takeoff, etc., merely plays his game, and therefore plays into his hands…Look away from him, and at the people who are working desperately to save what they can save of our Republic and our hope of avoiding nuclear catastrophe. Look away from him, and at reality, and things begin to get back into proportion…He is entirely a creature of the media. He is a media golem. If you take the camera and mike off him, if you take your attention off him, nothing is left—mud. Two or three years ago, the strategy of collectively ignoring Trump might have worked well enough to get rid of him. It seems less effective now. But I think that what Le Guin was advocating was less the idea of reducing him to irrelevance through our collective indifference, which is a ship that has unfortunately sailed, than of limiting his impact on our inner lives. The relationship between the private self and the state is a mystery that has been investigated by countless American writers, and the beauty of Le Guin’s work was that she was able to explore it on an interplanetary level. 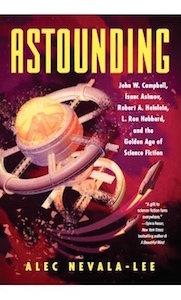 Science fiction has a way of making individual human beings seem all but irrelevant, to the point where the genre’s true hero, as the editor John W. Campbell often argued, is humanity as a whole. Its depiction of societies evolving over time may well be a more accurate reflection of how the world works than conventional realism, which has a way of overstating the power of free will, but it can also be frustrating for those of us who look to fiction for answers. Le Guin’s genius lay in taking this inherent tension and transforming it into one of her great themes, which was the role that specific people could play in the rise and fall of planets. It makes for a stark contrast with Asimov’s Foundation series, in which history is reduced to the statistical aggregate of trillions of lives, and it also avoids the trap of the Star Wars franchise, which until recently seemed to identify the fate of the galaxy with that of a single family. Le Guin’s protagonists aren’t chosen by fate, but they also aren’t rendered irrelevant by the scale of the problems involved. They’re ordinary men and women doing what they can to affect systems of unbelievable complexity. Earlier this week, I republished my post on The Left Hand of Darkness, which is the story of a solitary envoy, Genly Ai, who sets out to convince an entire planet to change its ways. A few years later, Le Guin revisited this basic story in The Dispossessed, which in some respects is even more interesting, because it comes closer to our own experience. If Genly Ai is almost unbelievably admirable and devoted to his cause, Shevek, the central figure of The Dispossessed, is a mess. The novel opens with Shevek traveling from his planet, Anarres, to its twin, Urras, which have been isolated from each other for generations. Anarres is an anarchist utopia, while Urras has developed along capitalist lines, and they exist in a state of mutual distrust. Shevek, a physicist, sees his visit to Urras as a way of bringing the two cultures closer together, or so he tells himself and others. In fact, his motivations are more complicated—he left Anarres largely because of professional frustration—and when he arrives at his destination, he makes a terrible job of it. He allows himself to be manipulated by the ruling class; he gets drunk and makes a clumsy pass at a married woman; and when he finally goes over to the side of the underground revolution, his only visible act is to give a speech at which scores of people are killed. In the end, when he returns to Anarres, he seems to have accomplished almost nothing, and the book ends on a note of ambiguity. (To be fair, Shevek also discovers the principles behind the ansible, a form of communication that travels faster than light, but this is handled almost as an aside.) It’s a messier, more frustrating novel than The Left Hand of Darkness, but it also more accurately reflects the nature of most political engagement, which is often driven by personal factors, and frequently leaves us unsure if any of it was worthwhile. The Dispossessed is on my to-buy list. Wonderful post, tracing Le Guin’s own examination of politics and ambiguity. Haven’t read The Dispossessed, but it’s going on my list right away. It’s devastating to think Le Guin died with America in such a state! Thanks for the great article. Yes that is exactly how I felt when Obama was President for 8 years. I believe Donald Trump has said and done some stupid things but despite that, he is a genius and he is doing great things to make America great again. We don’t hear all the great things our President is doing on mainstream media, all we hear is suspicion about how the Soviet Union supposedly helped him win the election. He won the election because he is a genius and he wants to make America great again and Clinton is a criminal and a traitor to national security and this country and if she had been anybody else she would have gone to prison for her crimes. Trump is certainly at the other end of the scale – he seems to see nothing but himself around him, his own reflection reflected, reflected, reflected. He would make a fine villain in an L. Ron Hubbard novel. I plan to read everything, every single thing, Ursula Le Guin ever wrote – including her last book, which was only published a month ago (https://www.amazon.com/No-Time-Spare-Thinking-Matters/dp/1328661598). She will be missed – but she’ll still have a say in how the world works, if we all do our jobs right. @camilleacey: Thanks for the catch! This was a great read. I’m a huge fan of sci-fi but never heard of Le Guin. Thank you for the introduction to her. Your post made me want to purchase all of her work. It was inspiring & informative. What times we live in when it takes courage to state the bleeding obvious. Le Guin is a hell of a writer. I read a book by her on the craft of writing. Very helpful. This is a really interesting post. What an interesting person. Thank you. Today Trump. Today The Wall. But in thirty years, what? All of this will be history, washed away by the trivial and the trite. We elevate heroes like Le Guin for the oversight. But in the end, what does it matter? Capitalists own the day. And the generations. We struggle because we’re human. But look at Le Guin now. She’s dead and knows no future, suffers no oppression, can gather no army. We think we have power over the universe, can think we can change the world. But we can’t and in the end don’t. Oh, we might perform a small kindness along the way, which may, in turn change the path of humanity. But that path, remember, is one of ultimate doom. The Universe is absurd and only our assumptions that it’s not, that we can affect it, are where we fail to understand. Le Guin thought she could alter the destiny of the Humanity. The destiny of humanity, as Ursula now knows, is death. looks like a lot of it is poping it upp all over the web without mmy permission. Do you know any solutions tto help stop content from being stolen? I’d certainly appreciate it.